The Anchorage-based company that’s been laying fiber-optic cable on- and offshore around northern Alaska over the past two years will activate the first part of its system tonight, giving the Prudhoe Bay area a big boost in broadband capacity. 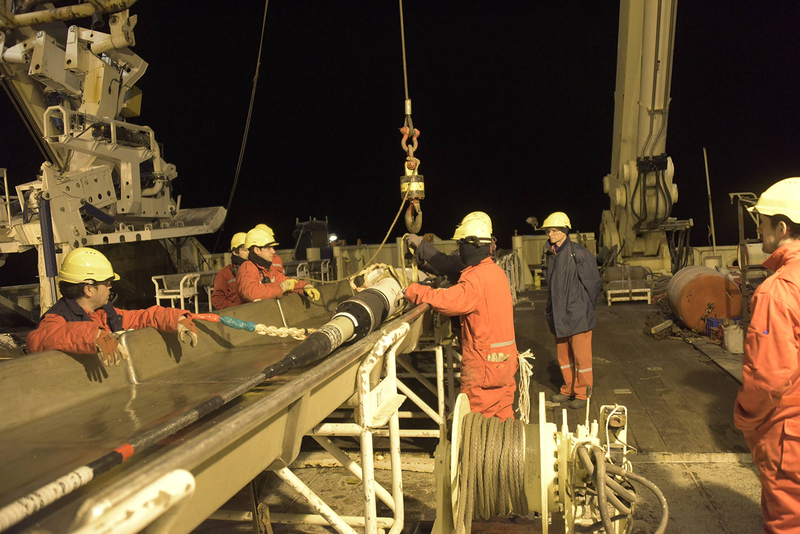 Personnel aboard a ship contracted by Quintillion prepare to reel out more of the fiber-optic cable the company has been burying in the floor of the Beaufort and Chukchi seas off Alaska's coast since last summer. 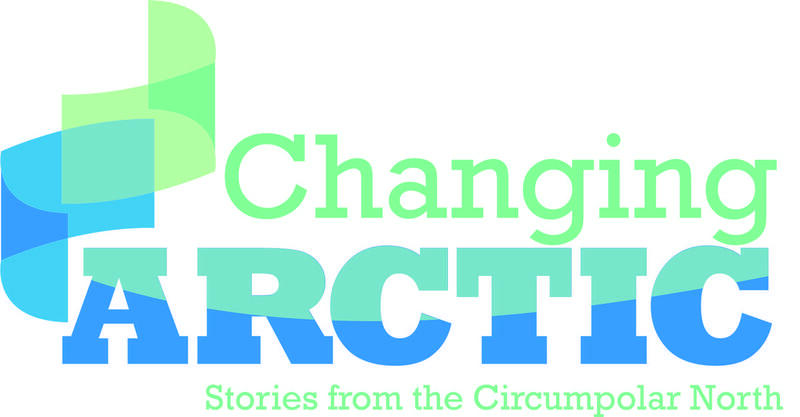 “It’s important because it lays the stage for the future connection, and connectivity into the communities of Utqiagvik, or Barrow, Point Hope, Wainwright, Kotzebue and Nome,” says Quintillion spokeswoman Kristina Woolston. She said in a recent interview that the company will connect those communities later this year. She says the company must first bring ships back this summer to some areas offshore where it had buried the cable, especially around Prudhoe Bay, to bury it deeper beneath the Beaufort Sea floor, so it’ll be less likely to be damaged by big chunks of sea ice. 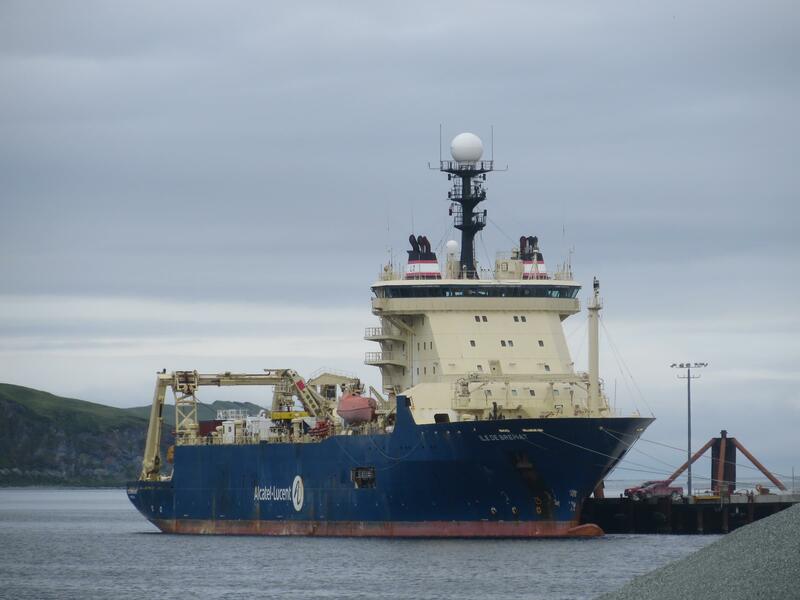 The Ile de Brehat, a French vessel contracted by Quintillion to lay its subsea fiber-optic cable, docked at Dutch Harbor last July, before it cruised on to Nome to begin work on the project. Quintillion’s project is the first to bring fiber optic connectivity to the five communities. And, Woolston says, it’ll eventually extend to others around northern Alaska. In most of those communities, the cable will replace the existing satellite-and-microwave ground-station technology, which is balky and expensive to operate and maintain. And, she says, it’ll offer much faster upload and download speeds, up to about 30 terabits per second. “It’s roughly 2,500 high-definition movies downloaded in one second,” Woolston said. 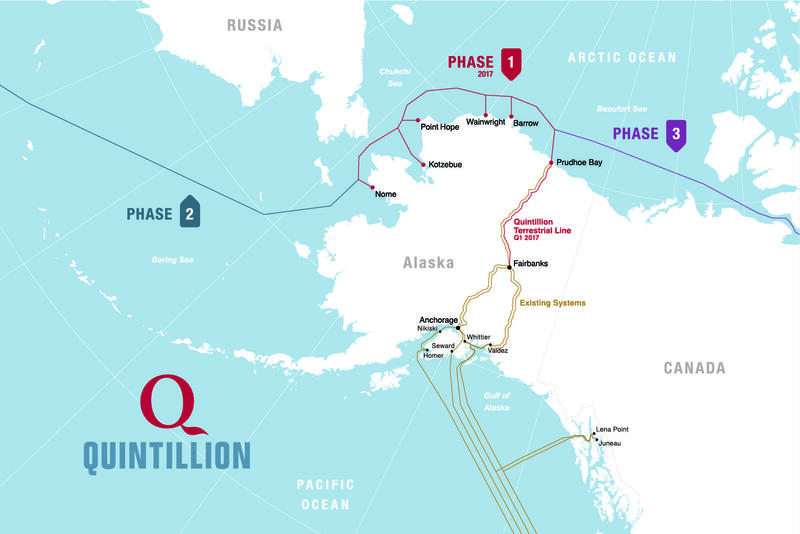 Quintillion will activate the first part of its Alaska-terrestrial fiber-optic system, around Prudhoe Bay, at midnight. The company hopes to complete work on the system later this year to extend the broadband service to five other communities in northern and western Alaska. Many of the customers around the North Slope no doubt will appreciate the entertainment benefits broadband will bring. But members of the communities who’ll soon be getting it more often talk about how faster and more reliable internet connections will help the area’s schools, clinics and businesses. If all goes well, Quintillion will celebrate the successful installation of this first section of its system in in an event to be held Monday at Deadhorse, just south of the giant Prudhoe Bay oil complex. The company has invited Alaska’s congressional delegation, as well as state and Alaska Native corporation officials, investors and others with the private sector. 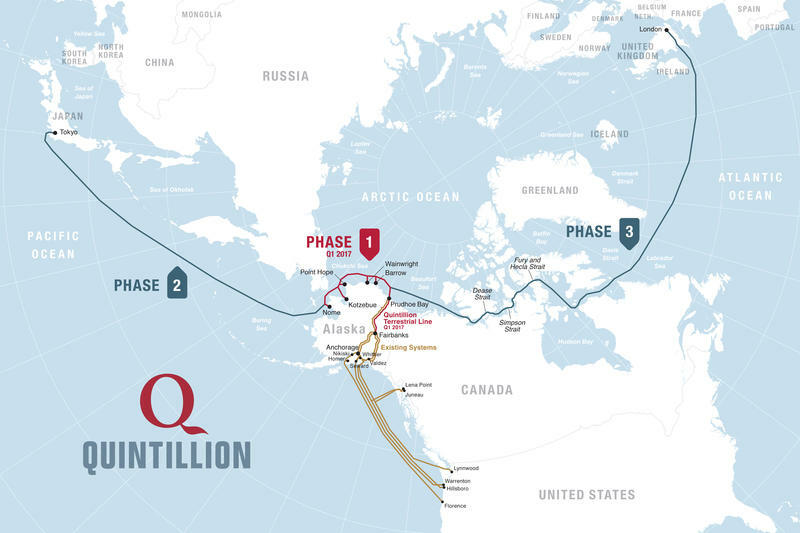 In the coming years, Quintillion and its partners hope to connect its Alaska terrestrial line with a 10,000-mile subsea cable that would run west from Nome to Asia, and east from Prudhoe Bay to Europe.